BMW unveiled its BMW i8 Concept at the 2011 Frankfurt Motor Show and couple of years after it they are here with the production model all set to rule the streets, carrying resemblance to what they promised back then. The hybrid model offers you all what you expect from a company like BMW to produce after this much time. Let us have a close look at the descriptive specifications and features of BMW i8 2015. Interior of BMW i8 2015 offers you 2+2 seating configuration. Talking about materials making the interior you has a special leather covering instrument panel and seats. The mentioned special leather is tanned with olive leaf extract and then presented to you with its stunning looks and comfort. There is a partition between the boot and passenger compartment made from chemically hardened glass. iDrive operating system comes as standard with your all new BMW i8 2015 whereas the instrument panel and center console are designed with a unique ‘layering’ principle that gives it a commendable and distinct look. 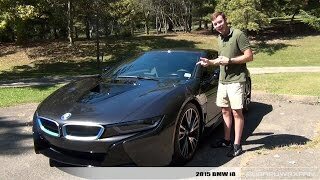 In all we found the entire interior of BMW i8 2015 gorgeous, luxurious and innovative. Exterior of BMW i8 2015 very much resembles to its concept. To us impressive part came through use of high-strength yet lightweight CFRP in creating the body. 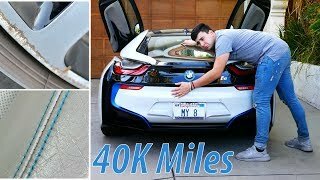 Thus use of carbon fiber reinforced plastic and aluminum keep the durability, safety and also keep the BMW i8 low with its weight. Talking about the looks we found them highly luxurious through scissor gate, rear view mirrors, hood with integrated air intake and the BMW emblem that resides over the front end of hood. Adding aggression to the entire front fascia come long and slim headlights with integrated daytime running lights and two large air intakes mounted beneath them over the sculpted lower fender. At the rear most impressive and precisely adding to aggression in overall looks is the quad exhaust system. 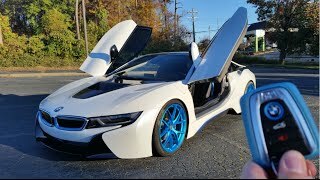 In all as we mentioned above the entire exterior of BMW i8 is pure sign of aggressive luxury. 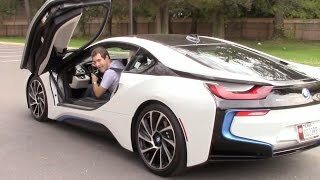 BMW i8 2015 comes with a 1.5 Liter three-cylinder engine delivering 231 hp and peak torque of 320 nm and an electric motor producing extra power of 131 hp and peak torque of 250 nm. 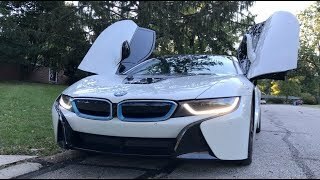 Thus the total output produced by BMW i8 2015 is 362 hp and peak torque of 570 nm paired to a six-speed automatic transmission while electric motor is connected to a two-stage transmission. With these power stats BMW i8 is capable of reaching 62mph from standstill in just 4.4 seconds while top speed touches 155 mph.